I picked up this recipe at Williams Sonoma last weekend and immediately added it to our menu. It looks fancy, but it was really simple to make. I cheated and used some Simply Potatoes Homestyle Slices, but feel free to slice your own potatoes. This tasted amazing!! I was really impressed. We seved this with the Italian BBQ Marinade that I posted yesterday. It was an easy and fabulous meal! Set eight ramekins on the baking sheet. Divide the potato slices among the ramekins, staggering the slices so each layer lies flat. In a saucepan over medium-high heat, combine the cream, thyme, bay leaf, salt and pepper and bring to a simmer. Remove the pan from the heat and discard the bay leaf. Add 4 oz. of the cheese to the cream mixture and stir until melted. Slowly pour about 1/4 cup of the cream mixture into each ramekin. Sprinkle with the remaining 2 oz. cheese, dividing evenly. 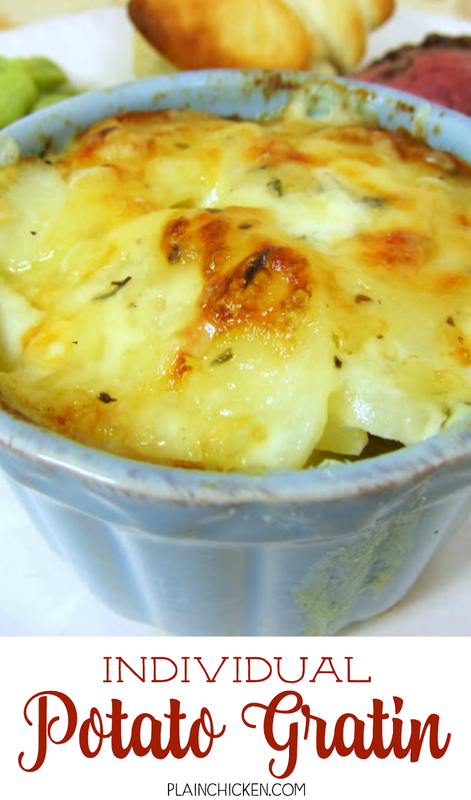 Bake for 25-30 mintues, until the potatoes are tender and the cheese is browned. Let stand for 10 minutes, then serve. Looks so good. I love the individual servings! How do you think this would taste with something other than gruyere? My husband isn't really a fan. I really like individual serving side dishes and this recipe sounds super good. You've been busy this week while I was away. Ashley- you could use Swiss or white cheddar. I think any cheese would be fine though. 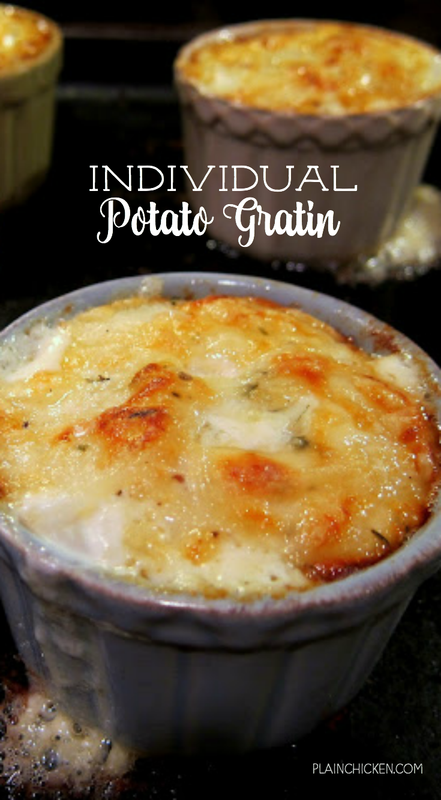 These individual serving would be a great way to stop me from eating so many of these - potatoes au gratin are one of my favorites. They look SO tasty! Thanks Steph! I think I'll try that this week. I think I'll make these this weekend! My kids don't like au gratin potatoes and making a casserole takes up so much space in the fridge with leftovers. Now I can just make enough for Alexis and me (and then of course Trevor will want some, right?). Can heavy cream be substituted with fat free half & half? OR something else? Just looking at the pictures is making my mouth water. To top it off, I'm already thinking of what our finger food catering sydney company would combo with this - and I haven't even started getting the ingredients out yet. I wonder hope this would freeze?